A large monster of a man, Forerunner is a marvelous amalgamation of various cybernetic and biotechnologies that first appeared during following the Uprising. Not much is known about this hard-hitting cyborg outside of his obvious ties to Leviathan. He rarely speaks and carries out his tasks with mechanical precision. While most of his cybernetic systems can be traced back to Cyber Assemblies and unique Leviathan technology, his body's core is a marvel of subdermal implant technology that no company on the open market claims to have developed, or even come close to replicating. He is the greatest kept secret of Tronne Bio-Engineering, the intact remnants of a great hero of the mid 21st century, Alpha-Omega. Resurrected to be one of his most formidable weapons against Valor, Ambrose Ghrayl turned the man into a personal cybernetic lackey for Magistor using the old hero's battered body as a base. Though most of Forerunner's body has been replaced by Leviathan and Tronne bio-technology, the preserved fragments of Alpha-Omega still remain inside, kept in a state of technological unlife. With much of his aging flesh replaced by cybernetic technology and synthetic biotech organs, Forerunner is far stronger and faster than Paramount, able to fight the likes of Jaximus to a standstill, and his manipulation powers almost rival those of Legacy. He can run at super speeds as well as jump incredible heights, but is incapable of flying. From time to time Forerunner will manipulate a slab of earth, rock or piece of building to hover above the city looking for his enemies. Utilizing compressed anti-matter reactor technology, Forerunner has nanite created Tritinium servos and actuators that power his arms and legs. Coupled with bio enhanced reflexes and the fragments of his super senses, Forerunner has been known to catch bullets out of the air and punch so fast the victim is dead before people even hear the impact. His strength is also to such a degree that he is able to resist the heavy gravity forces exerted by Legacy and simply walk through his force fields. Forerunner has no personality of note. He is a killing machine and a final insult to Valor. At the height of the Intergalactic war in 2075, a young hero by the name of Alpha-Omega entered the scene behind the banner of Valor and helped quell the Alien assault on Earth. Determined as one of the most powerful supers ever born, his powers registered beyond comprehension in matter manipulation and reality alteration. Alpha-Omega's powers were at such a heightened level that he could wipe away vast armies on the battlefield with a simple swish of his hand. For the next 14 years, he served as Legacy's right hand man for extra-planetary defense and was Earth's big gun' to deter Leviathan, as well as alien threats that might consider Earth weak. It was his undying loyalty to do good that was Alpha's downfall. On September 5th, the most pivotal day of the super Uprising, Ambrose Ghrayl, master bio-geneticist and creator of the hyper serum, Sequence 22, tricked Alpha-Omega into a fatal trap orchestrated by Magistor. Knowing, the full might of Leviathan was no match for Alpha-Omega, Magistor worked with Ghrayl to create an anti-hero serum. Based on earlier work from the A.R.M.S. 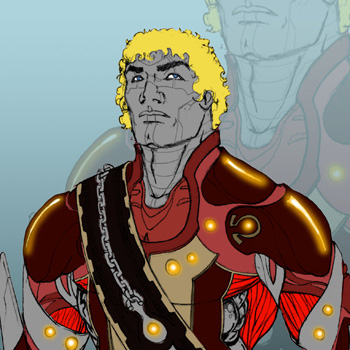 Pandemic of 2060, Ghrayl created a necrotic toxin that would attack the source of Alpha's powers and prohibit him from attacking or even reconstituting his own body. This similar technology would also be applied to trick Glimmer during the attack on San Diego that same day. Lured to Hawaii under pretenses that Ghrayl had uncovered a secret weapon designed to kill Legacy based on his alien DNA, Alpha-Omega insisted on handling it alone to keep Legacy safe and out of harm's way. It would be Ghrayl's greatest betrayal to Legacy and forever be the shattering rift that broke their trust of each other permanently. When Alpha-Omega arrived on the scene, Ghrayl was on location to hand him the device. Unable to sense what it could do, Alpha chose instead to simply alter the matter of the object to become sand. Upon using his power however, the unit locked onto Alpha's powers and immediately began eroding him away on the molecular level. Following Magistor's wishes to the letter, Ghrayl had cameras hidden everywhere to record the incident as unrefuted proof that Leviathan was unafraid. For several agonizing seconds Alpha-Omega, the world's most powerful hero roared with fury and pain as every cell of his body began to boil from the outside in. When his limbs were nearly gone, his face little more than a skull connected to his torso, Ghrayl turned off the cameras before releasing a catalyst enzyme that halted the erosion and retained the nearly useless husk of what was left. At that moment Alpha-Omega was declared legally dead and Ghrayl returned to Tronne Bio-Engineering headquarters in Houston, Texas. For the next several months, they kept his remains in a stasis tube while Marcus Haelan and his team used Project Achilles nanites to rebuild what they thought was an unfortunate victim in the explosion that toppled San Diego. While they declared they could successfully rebuild a functioning organ-augmented body, the brain was so far gone it would be little more than a programmable chip and no longer capable of sentience or free will. Ghrayl, happy with the results, then shifted his body of work over to Cyber Assemblies. Utilizing Leviathan's living armor prototypes and Cyber Assemblies' newest Zeus Line cybernetics he crafted the ultimate body for his monster. Alpha-Omega's twisted synthetic core was then put into the hybrid destroyer armor and his remains were then reanimated and brought back to life. Days later, by mixing his own blend of bio-engineered cocktails, Alpha-Omega's matter manipulation powers were restored to a shallow fraction of his former glory. At this point Magistor stepped in and made the final personal touches to Alpha-Omega's loyalty and violence parameters making him eternally dedicated to Leviathan, and dubbing him "Forerunner." Forerunner is the ultimate warrior. A lethal force without malice or conscience. A fallen God in the body of an indestructible puppet manipulated at the hands of his master created to do unspeakable acts without question.